Morecambe have turned down a bid from Blackpool for striker Jack Redshaw. The Shrimps were contacted by The Seasiders last week but have knocked back an approach from the League 1 side. 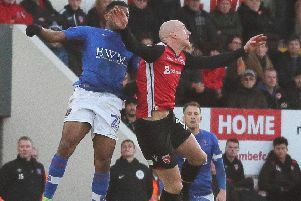 Redshaw, the subject of interest from Rotherham and Peterborough amongst others in recent seasons, has starred for The Shrimps since joining from Altrincham in January 2012. A Morecambe FC statement said: “The club can confirm that (Blackpool chairman) Karl Oyston spoke to (Morecambe chairman) Peter McGuigan regarding a transfer fee for Jack Redshaw. The 24-year-old former Manchester City youngster has one year remaining on his current contract.